Dynomite! is an ongoing segment where I publish submitted photos from the ’70s, ’80s or ’90s of readers demonstrating their fashion A-game. All accepted entries published on my blog will later compete in a Dynomite! All Stars competition like this one here. I faced a teeny-tiny bit of a philosophical dilemma while sorting through the submitted photos from our newest Dynomite! contender. Why, why must they send me so many delectable creampuffs and then make me choose just one? It’s gut-wrenching. It’s like King Solomon decision-making. It’s like choosing which half of your baby’s torso you’d prefer. It’s like when someone asks if you prefer puppies over kittens. Holy Homespun Halloween. It’s amazing. It’s perfect. It’s like a dream come true if I were to fall asleep and then wake from inside of a toothpaste tube. My dilemma is this — does this photo really conform to the very elite, very rigid, very arbitrary standards that I have laid out for Dynomite! contenders? Outside of Halloween parties, dentist ribbon-cutting ceremonies and Let’s Make a Deal tapings, did people of the ’70s, ’80s or ’90s typically breakdance and walk around in toothpaste tubes? True, 1982 saw parachutes made into pants. And I suspect Country Crock margarine tubs formed the basis of Crocs footwear. But it just wouldn’t be fair to the other contenders. If I allowed theme costumes into the Dynomite! competition, next I’d inevitably be choosing between a Daisy Duke drag queen and a Caucasian Mr. T in a yarnhawk, and then I’d be back doing the gut-wrenching Sophie’s Choice thing again. So instead I have for you another worthy submission from Jules. So instead I give you puff-sleeved rainbow-striped girl with the greatest unintentionally feathered hair I’ve seen this side of 1987. And that, my friends, is what I like to call “bratass”. Bratass as in attitude, the ultimate fashion accessory. Bratass as in the highest level of style sophistication any brat could ever hope to achieve. Bratass as in 1981-Angie might not have looked chic in that terry cloth romper but her sneer made her the classiest kid on the tornado slide. And if you want to see even more pictures of Jules looking bratass, check it out here. ← What the . . . Teddy Ruxpin? Angie! You reminded me that I got Farrah Fawcett bangs to the horror of my ballet teacher. I didn’t stick with ballet. Pictures please, Amy. It’s like it didn’t exist without pictures to prove it. Your ballet teacher was so out of touch. I think the photo is buried away. But if I ever find one, I’ll be sure to share. I hope you are having a great day. Thanks, Amy. I hope you have a great day, too. I assume/hope you’re safely away from the earthquake-affected area? Thank you for asking. The epicenter was about twenty-five miles north of Bologna. We are fine, but it’s very sad to see what happened in the affected areas. That’s extremely close, Amy! Wow. I’m so glad you’re okay but so sorry for all the people affected. Ah…feathered bangs. That takes me back. I have distinct memories of standing in front of our hallway mirror circa 1983 and trying desperately to feather my bangs on the sides. They stayed like that for all of 6.5 seconds. It took me years to understand I needed Aqua Net to keep that look going. And by then I had moved on to asymmetrical mall bangs. I couldn’t make the feathered bangs happen either. One side would work out okay. The other would flip up like a 19th-century villain’s mustache. Exactly! I too experienced the one side feathering and one side flipping up affliction. I’ve been cursed with asymmetrical hair in every phase of life. Man, I am loving Jules’s feathered look. Reminds me of my best friend back in the day. And that toothpaste tube is amazing. I’m so making my kid be that for Halloween. The cap is awesome! A lampshade-turned-toothpaste-cap — isn’t that the most brilliant Halloween invention ever? I think Jules said her mom made this costume from scratch. My feathered bangs are not present in any of my old pictures because I could never get my bangs to stay that way. It’s like it never even happened. Wait, feathered bangs are out? You’re in luck, Elyse — feathered bangs will be making a comeback soon. In fact, they made a comeback about ten years ago when That ’70s Show was all the rage. In about five more years, I’m certain you’ll see feathered bangs comeback Part III. Styles do always come back. So I just stick with them to get ahead of the curve. I actually had that happen with a suit I bought in about 1985. It was navy blue with white polka dots and was very stylish then. It came back into style three times, including once while living in Geneva when I was wearing the suit and received a catalog from Talbots with the suit on the front cover! I have a silk dress with polka dots that I bought in Paris when I was an idiot high school kid who thought it was better to blow your Europe vacation money on clothes instead of things that will actually matter in 20 years. I am still waiting for it to come back in style but, by the looks of it now, I wonder if it ever was. 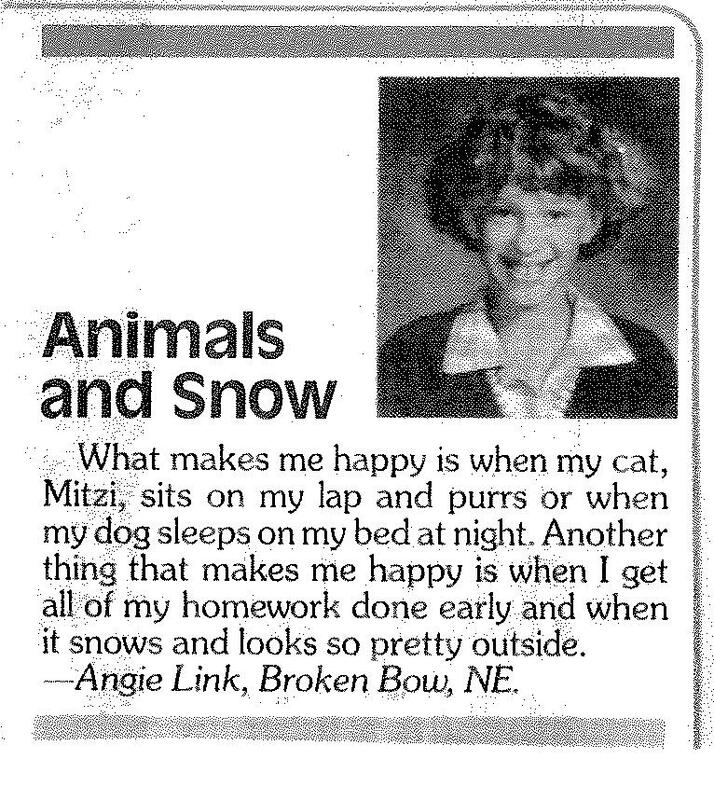 I think you have this all wrong, Angie. You put it on, and wear it to the best fetes stating, “yes, this is the dress I got in Paris. It’s the latest, you know.” You will be the trendsetter. You’re turning me around here, Elyse. Maybe it wasn’t a mistake to purchase the ugly dress over the inlaid wooden jewelry box in Cordoba. It’s all in the presentation. Personally if I would be to wear a dress I bought in high school I am quite certain to be arrested for indecent exposure. I also have a pair of red gingham hot pants I bought in London and you will never see me wear those again. My children would be taken by social services. Oh my, my, my….Jules, you were adorable! Toothpaste tube and feathered hair and all! I think I had that same shirt. I know I had that same hair. Darla, now YOU were a cute kid! These aren’t even my ugly pictures. Oh, the horror!!!! 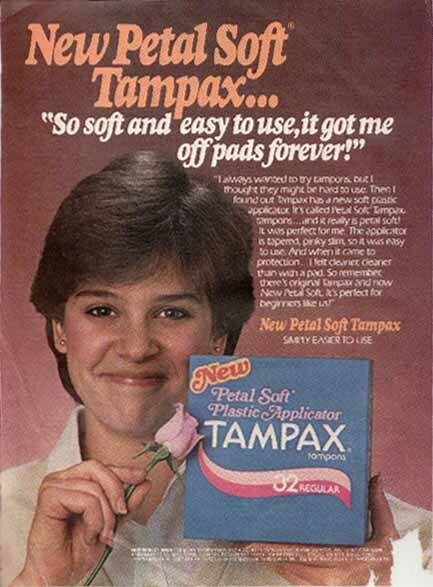 Well…um…you haven’t even seen the one of my with my crossed-eyes and Dorothy Hamill do. Or my high school yearbook photo with what appears to be a large cat sitting on top of my head. My ugly pictures have never even been seen on here. Sure, I’ve shown many ugly pictures of myself…but I can say with all certainty that it got much, much worse. I don’t know that my husband has even had the pleasure of seeing some of those gems. I’m loving that hair too. I don’t think Jules would have been near as happy if she got that perm she ordered. Every perm back then was a huge mistake. Even ask 1988-Angie. I believe I had the same shirt, too. 10-4 on the haircut, too. Missed out on the Crest, but I LOVE that costume! Great pictures, Jules. Thanks, Lenore! I’m so, SO glad I’m not alone here. Yes, Lenore, but you are the only one who can rock a bolo tie. The bolo tie!! How could I forget! I don’t stand a CHANCE here. Oh, dear. I think I have that hair right now. You crack me up. “Holy Homespun Halloween” and “True, 1982 saw parachutes made into pants. And I suspect Country Crock margarine tubs formed the basis of Crocs footwear” got me especially. Aw, I feel so warm inside! To be trusted with fashion masterpieces like these, I must be pretty damn awesome. To confirm, did you say Jules Sr. (a.k.a. Babs) made this costume? The lampshade is nothing short of costume-making genius. My mom is probably reading right now and wishing she thought of this during her costume crafting days. She sure did! It was a pattern we got from a craft store, so we didn’t come up with the idea, but I think together we executed it perfectly. You two are like some kind of crazy designing machine! Knocking down buildings to get to a Pier One fork and spoon, knocking down bolts of fabric to get to the toothpaste costume pattern. I wouldn’t want to cross you two when you’re on a mission. That Halloween costume is awesome! Thanks for sharing the pics! When I requested that all of my hair cut off, I was about 4. Once it was gone, I cried. And then I cried some more. Oh, Thoughtsy. You’re welcome. Your turn. I feel like crying with you right now. Tragic! I had a similar encounter except it occurred when I asked for a perm for my shoulder-length hair (circa 1988). I ended up with the Shirley Temple hairstyle you’ll see at the far right of my blog. That was the shortest my hair has ever been on record. This is probably why my hair has been long for the past twenty years. I’m terrified to go short and end up with THAT. .Jules, you were adorable! Really. And you look great in a toothpaste tube, which very few people can pull off. Angie, l so loved your biblical reference. Very applicable. These decisions are truly of biblical proportions, I’ve no doubt. Lori-Ann, you are too kind! Seriously. Way too kind. I love that story, Lori-Ann! That is seriously one for the books. I think my fine, limp hair would’ve behaved similarly. I don’t think most people could achieve Farrah’s ‘do. She was like some kind of blond cyborg. Hair like that only comes around once in a lifetime and only when it’s been created in a lab for the advancement of our species. Pudding bowl haircut — fabulous description. Alas, I think I had more of a pudding pop haircut. Love the costume!!! AND the hair + rainbow shirt with puffy sleeves. What a great blog. Jules, thanks for sending me here to check it out. Nina, I would say it’s my pleasure, but that seems the wrong sentiment when offering up such juicy blackmail options to the blogging public. I think you’re much better off allowing me to post Toothpaste Cap Head on my blog than to post your college keg-stands on Facebook. Either way, your next job-hunting search might be, um, interesting. Thanks for stopping by, Nina! You probably already knew and loved Jules, but could you even imagine loving her more? She is a pint-sized fashion icon. Funny pictures. Terrific idea for a contest! I had a similar experience with a hairdresser not understanding my request. One time I asked for the Dorothy Hamill cut and came out with Mark Hamill hair. Dorothy Hamill turned Mark Hamill! (Although, when I think of it, their hair in the late ’70s was sort of similar?) This is my favorite comment of the day! Nooooooo! So you instead of Jane Fonda in Klute you got the wicked queen in disguise from Snow White — the black cloak and everything? That makes me weep! I did! I think she said, “Muahahahaha!” as she snipped away! That haircut looks like the Dorothy Hamill cut I had in 1977 AND the Lady Di cut I had in 1982. And just have to say I LOVE the irony of the toothpaste eating a basket full of candy. That’s what I thought. It’s like an advertisement for dental hygiene – irony division. I’d love to see 1993-Jules trick-or-treat the dumb dentist on the block who’s always handing out toothpaste, raisins or nickles. HA!! It’s a picture that works on so many levels. Thank you for opening my eyes to that. You really could make that picture into a greeting card. I’m serious. Sell it to Hallmark’s Fresh Ink line of cards. I would buy it and send it to all the good people of the world. I loved the Lady Di cut of the early 80s. She was so adorable back then. I liked her look best when she was still wearing sweaters, culottes and sporting that ‘do. Yes, the irony is fantastic! Perfect Kodak moment. That adorable photo was obviously taken while still in the stylist’s chair. 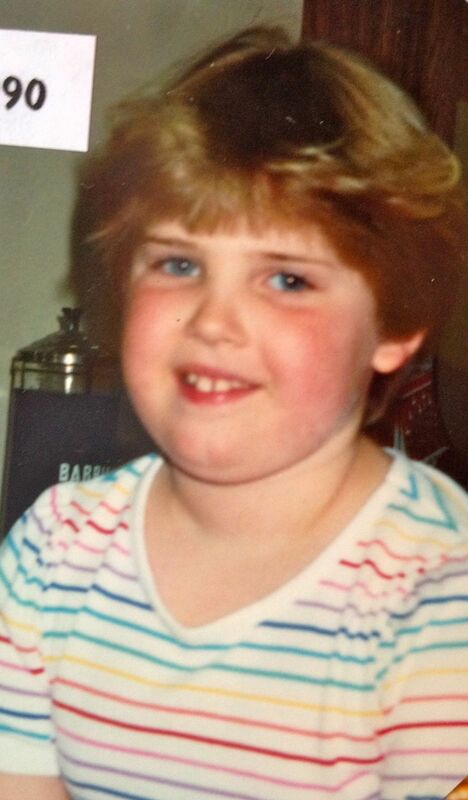 Was young Jules, chipmunk in training, able to maintain that awesome level of featheredness on her own???? Peg, first off, I have you to thank for bringing me to the awesome Angie via your plan to take over the blogosphere! Tragically, I have NEVER been able to achieve that look again. But my husband thanks me for that. I thank Peg for introducing me to yours and a few other blogs. Peg’s the conduit of a lot of bloggy friendships around here. Although, I must say we were bound to meet at some point, Jules. Our kind always finds each other somehow, through a chipmunk pow-wow or whatnot. This Angie/Jules love fest is like when you can’t wait to introduce your new boyfriend to your best friend cuz since you love them, you’re sure they will love each other. And they do, which is great, but you didn’t really want them to love each other to the extent that they run off together and leave you with nothing but a pathetic “Dear Peg” letter. It’s not you; it’s me. Actually, it’s me and Jules. You just don’t get chipmunks like we do. Sorry you can’t join us for the annual chipmunk sight-seeing slumber party next weekend. We’ll try not to gossip about you too much. Look at the bright side, your bra would’ve been the first to be frozen. No pathetic plea for validation going on for real. I’m kidding. JUST kidding. Yes! That’s what I thought too, Peg. Isn’t that the disinfectant-filled comb jar in the background, Jules? And do I see hairdryer/crimper cords? Angie, where we differ is that I’ve spent many years learning to block out these memories, followed by a strict diet of vodka to make sure any lingering memories were completely wiped out. I seriously don’t remember having this picture taken. I purge out any recent memories to save room for all my old memories. So don’t ask me what I learned at that work conference I attended three years ago. But you need to know the cast members’ names from Facts of Life, including the first two seasons when Molly Ringwald appeared? I’m your girl. I have a Barbisol disinfectant-filled comb jar in every bathroom. Doesn’t everyone? Yep. I keep shrunken heads in mine. Your blog really reminds me that I need to start scanning all my old pictures. Duh, this is your post, not mine. You are more than welcome to reply to your admirers. It’s like I’m just here hosting the shower and handing out cream cheese mints shaped like toothpaste bottles. The comment gifts are all yours. And then send one to me. C’mon, all the cool kids are doing it. Well, now I know what I’m being this Halloween! I love it! Please, please, pleeeeeeeease put it on and take a 2012 updated photo in the costume. Then we can side-by-side the two pictures. It would be the highlight of my entire year, Jules! Do it! No. It’s too obvious, since I look just like her. It would seem braggy. I really think I had that shirt. And you are rocking that short Farrah do!! I love the costume, too. You were super adorable! I remember having this awful short perm, braces, and a pink lace dress in a school picture from 5th grade, where I am casually leaning on a telescope with a backdrop of haley’s comet in the background. That is probably my most magical picture ever. Then I remember a year or 2 earlier where my mom dressed me (unintentionally?) as a librarian and I had a Dorthy Hamil cut and I was sitting on this treasure chest thing, pretending to read a book with a faux library backdrop. The 80’s were awesome for tragic school pics! Misty. Misty, Misty, Misty. You know you aren’t going to get away with just TALKING about these gems, right? Wow!! I am dying picturing those backdrops! And I feel like I took a pill and landed in Oppositeville with everyone saying these pictures are ‘adorable.’ Or bloggers are just really good liars / even nicer than I thought. Holy cow! You totally reminded me of the most awful photo backdrops from the 70s and 80s! I forgot about the starry night and bookcase backgrounds. I had plenty where I was (apparently) standing in the woods in Vermont. Alas, none standing in a cornfield, despite that I grew up in Nebraska. Was that Mary Lou Retton hair? If I say yes, does that work for or against me? HA! WOW. Angie, have you seen this picture?? I really think it needs to be worked into your blog if it hasn’t been already. Every flaming back cover of Teen Miss (I loved it, even if I had no money to ever look like ANY of the stuff in there) for 3 years. Yes! It’d be perfect on my blog! Don’t bother reading either (time suckage) but definitely scan them for the ads. There are some doozies in here. Yes! From her Wheaties box picture, right? The feathered hair really is a thing of beauty, Jules! Audrey, you are as nice as that bowl of candy I was trying not to devour in that first picture. I really think I should take some of Angie’s advice and start submitting these to the people who make the Awkward Family Photos greeting cards. The lengths to which I’ll embarrass myself in order to retire by 35 are yet to be tested. See, now everyone’s wearing feathers in their hair when they could instead be feathering their hair. Oh, kids today; style is lost on them. Oh my gosh, that toothpaste tube costume is awesome. The whole white-face thing and all. Just plain classic. Jules, this is now etched on the tiny grey cells in my brain. You might want to do a post on this so second hubs can spot it. Be sure to tag his name in the post so he can search it easier. Holy Chipmunks, that was great. I vote that she changes this to her gravatar image. I think she mentioned doing so as a joke, but I’m going to hold her to it. Don’t you worry, MJ — you haven’t seen the last of this picture. When I was in high school, all the girls got perms to make their hair pretty so I did too. I have very coarse, aggressive hair that takes to perms with a vengeance, and I ended up with a truly appalling helmet of dark curls. Inexplicably, I did it again in college, this time with a spiral wrap treatment that lasted for two years, until I finally cut it all off. And Jules? An eight year old confident enough to lip off to the salon lady and flaunt the subsequent cut must be destined for greatness! Ha! Lynnette, isn’t it truly stunning how we SOUGHT these ‘dos?? And I chopped mine all off again 10 years later! Do you think we’ve finally learned? Hey, I’ve seen you rocking the Little House on the Prairie braids! I could never pull off that look. You looked adorable! Awww, thanks! The tiniest braids ever, thanks to my mullet cut! Good times. 1. Does anyone else see the irony of a giant tube of toothpaste happily munching on a piece of sugar and Red Food Dye #2 on a stick? I mean, Halloween costumes aren’t in the same league as normal, everyday fashion atrocities, because Halloween costumes are meant to be silly. 2. I agree about Jules’ hair, but I really don’t think that shirt is Dynomite-worthy–it’s far too ordinary. I had a similar shirt when I was about six, but it was black (and long-sleeved) with fluorescent stripes, and that wasn’t even one of the most egregious things I wore, like the photo I sent you with me decked out in a pink skirt with green polka dots, pink loafers, pigtails tied with shoelace-style ribbons, and Minnie Mouse socks. I hate to blow my own horn, but you’ve shown more outrageous stuff than Jules on here. Way to pull Alanis Morissette into this. Now I’m reminded of You Can’t Do That on Television, a post for another day. I can’t even tell you how long I stared at that Crest costume picture. Is it wonderful? Awful? I can’t tell! Next time I feature you on my site for any reason, though – boom. Got my new “Jules” pic. And would they not give you a perm because you were 8, or because they were, like, “It’s 1990. We don’t do that any more.”? That costume is mesmerizing; there’s no getting around it. It has special powers. Totally still have it. Totally wore it again (in my early 20s, sans white face paint) to promote Peppermeister’s band. (A band that had nothing to do with dental hygiene, but never you mind.) I am SO sad that it never occurred to me to use that picture as my gravatar until this post. I guess it’s never too late. If you save that file, all I ask is that you name it: This-is-My-BFF.jpg. I have fine straight hair and secretly hope that perms return. Never mind the fact that my hair turned into a troll doll head when I had a perm. Yes, I agree that the 80s and early 90s sort of ran together. The early 90s was an interesting time, with both Seattle grunge and New Age hippie looks evolving — meanwhile mullets, mall bangs and shoulder pads were still hanging on for dear life. “It’s 1990. We don’t do that anymore.” Fantastic! Oh, funny, funny, funny stuff. Jules, can I now insert a joke here about New Jersey being behind the times in fashions (ahem, mall bangs, cough, cough), or is that not where you grew up? Or is that going to make you hate me? OMG! I’m glad you didn’t resist, Elyse! That was AWESOME. I’ve never heard of him, and I’m still not sure if it’s supposed to be funny or sincere (or both), but either way, it’s SO TRUE. We will totally adjust, man, because we don’t expect too much. I feel like I get myself even more now. Fantastic! I get him. In fact, I can write my own about growing up in Nebraska. I never lived on a farm; none of my friends did either. Shocking. I can tell someone’s a really good musician when they look like they’re in pain when they play. I couldn’t resist. I am from Connecticut and it is a deep rivalry. To the extent we Yankees notice our southern brethren…. Um, I am still waiting for the Dallas era to come back. I will cover myself in fine furs, jewel toned polyester dresses and gorgeous huge hair. Like Tammy Wynette once said, “the higher the hair, the closer to Jesus.” Truer words have never been spoken! 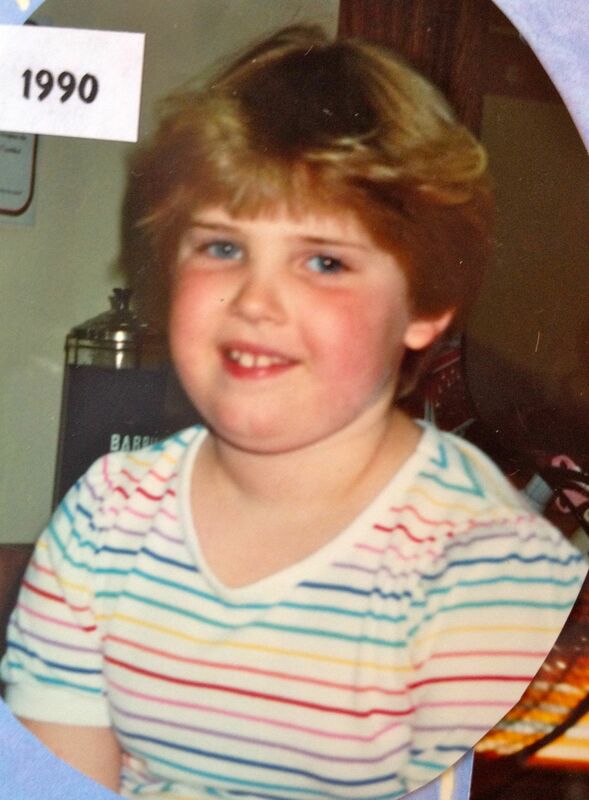 Oh, and I totally had that rainbow t-shirt. What self respecting 6 year old didnt? You and Dallas are like a match made in hot pink taffeta heaven. I sometimes daydream about being Victoria Principal, just so I can imagine what it’d be like to kiss Andy Gibb. Feathers were indeed all the rage. Being of the super-straight-hair variety, I’d completely forgotten about the need to “force” my Farah feathers with a curling iron and hairspray (not in that order). If that didn’t cause my hair to break off in clumps, the home perm of the next near certainly did. I still wear the burn scars around my neckline and forehead. Really. Oh, and Jules, dear, I had the same rainbow shirt — in tube top. Feathering may come back one day, but some things just need to stay in the past, or at least in my dusty old photo box. Home perms! They were much like doing an explosive chemistry experiment in your garage. I remember this commercial: “Salon perm?” “No, Ogilvie home perm!” Really? You mean you intentionally created that look, fuzzy-haired chick? I lost much hair from 1980 through 1987 from perming, ironing, bleaching (peroxide? really?? ), oh…and I think I actually used lemon juice on it a couple times. Not sure what I was ever thinking. OH. That’s right. I wasn’t. What about Sun-In? It seemed so harmless. It came in a spray bottle like hairspray. Simply spray on and sit in the sun and let your hair bake. What a great idea! My poor brunette friends did this and ended up with hair the color of marmalade. Awful! I caught that show when we were on vacation (since we don’t have cable, we rely on vacations for those types of TV-watching guilty pleasures). Hmmm…does it work? 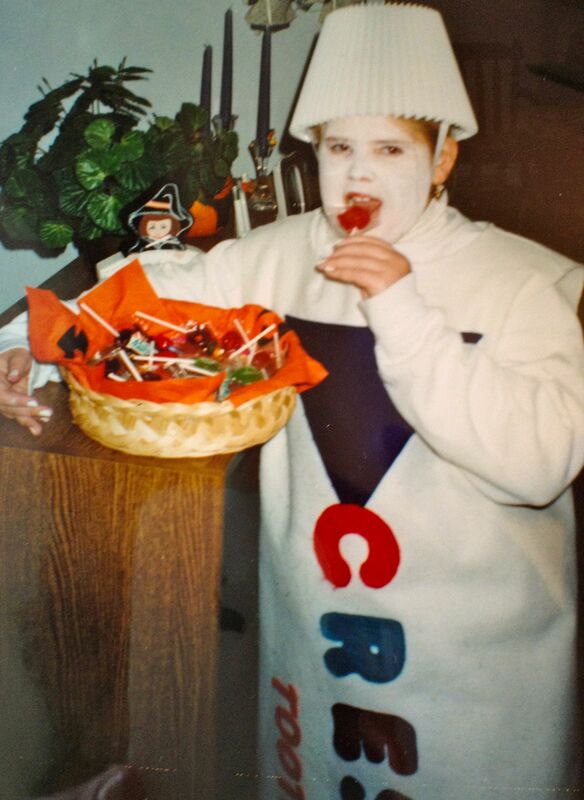 Jules – I could have used you the year that I dressed up as a cavity for Halloween. Nobody got me that year, which carried over into several painful years of junior high. I still don’t understand…cavities are scary. Mark, please tell me you’re serious. That is amazing. I floss, like, twice a day. I cringe at the thought of a cavity standing on my doorstep asking for candy. It sounds like a 1980s cartoon PSA. I may or may not still wear my hair like that. Plus, I may or mat not still wear the band uniform. Does that make me a hopeless dork? Or a pitiful doofus? I think that makes you a potential winner of the Dynomite! contest. Lisa, it doesn’t matter how you dress or wear your hair — you’re a misfit like me, which makes you too cool for school. I can’t stop laughing at the toothpaste photo. 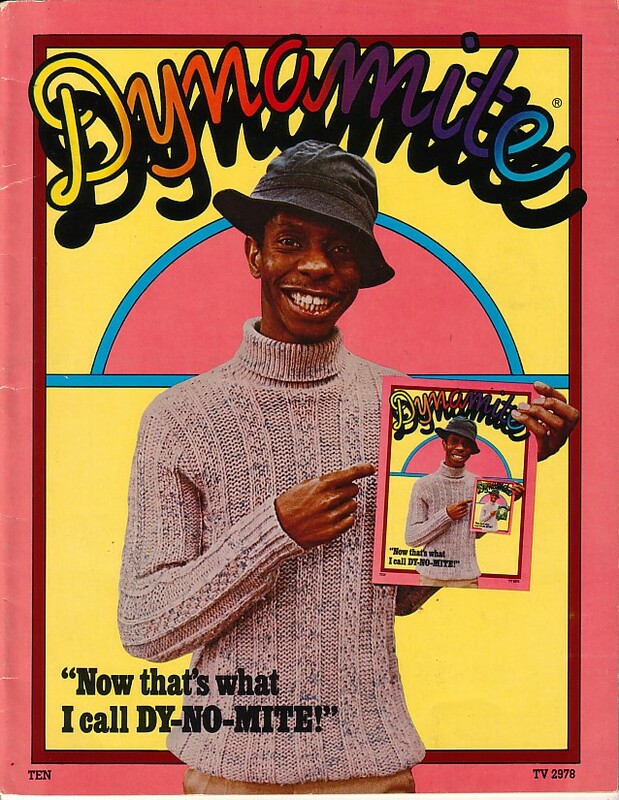 So, on these Dynomite entries…are you looking for fashion reminiscent photos or does straight up embarrassing work, too? I have a few I’ve been saving for future blog posts, but I might have to send some your way instead. Drop the photo to me in an email if you decide to send something. You won’t be sorry. Oh, wait, actually I can’t guarantee that. I request that photos show fashion (clothes, hairstyle) of a bygone era — of the ’70s, ’80s or ’90s — that hasn’t been seen for a decade or more. I bet I’ve seen a couple photos on your site that would be perfect entries. The toothpaste photo wasn’t an entry per se but I couldn’t resist using it. Hmmm…I’m sure I can come up with a couple good ones. Slap Bracelets Comeback – The GRAND (Oh, it’s Grand) Finale! | Go Guilty Pleasures! I'm a Pepper! Wouldn't you like to be a Pepper too? Enter an email address to receive post notifications by email. Rachel — you are Dynomite! This is your brain on 1979 preschool.